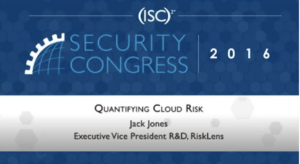 In September 2016, Jack Jones had the opportunity to present at (ISC)² Security Congress on measuring cloud-related risk using FAIR. An organization used FAIR to assess the risk associated with migrating to the cloud. The set of analyses that were done to inform that decision. The challenges professionals face when it comes to analyzing and communicating risk. Please note that the video is hosted on BrightTALK and will require a log in. Signing up for BrightTALK is free of charge. Watch the video today to see how FAIR was used by this organization to assess risk associated with migrating an application to the cloud.